We're now past that all-important September 21 date - when the first 30 countries got the iPhone XS and XS Max the second 29 countries can pre-order them. The new duo is clearly very expensive, but we thought we'd put a bit more perspective to that. 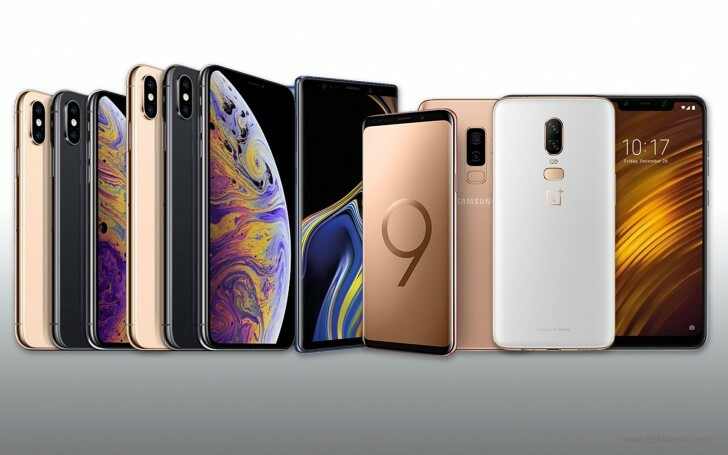 So here's what other phones you can get for the same price as Apple's iPhone XS and iPhone XS Max. For this I've rounded up a few of the more popular phones - the Samsung Galaxy Note9, Galaxy S9/S9+, the OnePlus 6, the Google 2 XL and, for the heck of it, the new Xiaomi-made Pocophone F1. I've left out a few other phones from other brands as this is all about illustrating a point, not make a complete recap of the smartphone landscape. The chart below lists the smartphones, their official retail price in Euro and Pounds and their current price through a third party retailer (in this case Amazon). We'll be focusing mainly on the market and prices in Euro but you can easily find out the same prices in Pounds or any other currency. You'll notice that devices like the Galaxy S9/S9+ and the Google Pixel 2 XL are much more affordable through Amazon (and other online retailers) than they are through their maker's official stores. We've listed full retail prices without a carrier contract but in most cases contract prices tell a similar story. So, let's say you're thinking of buying the 6.5-inch iPhone XS Max but you're not sure if you should spend that much money on a new phone. You could get a Galaxy Note9 and save up to €400 (only €250 if you buy directly from Samsung). You'd be getting a slightly bigger screen (no notch), twice the built-in storage at 128GB and enough money left over to buy a Xiaomi Pocophone F1 or go on a trip. Passing on an iPhone XS Max for a Samsung Galaxy S9+ nets you even bigger savings. You'd save €300 if you buy directly from Samsung or a whopping €620 if you go to Amazon - add another €10 and you can buy two Galaxy S9+' for the price of one iPhone XS Max! If you choose a OnePlus 6 over the iPhone XS Max you'd save €700 - that's enough to buy another OnePlus 6 and equip both with a case and tempered glass protector from OnePlus. And just for the heck of it - if you turn that iPhone XS Max money into Xiaomi Pocophone F1's, you can have three phones and enough cash left to buy a Xiaomi Mi A2 and a few cases. And what if you want to buy an iPhone XS, the new 5.8-inch iPhone? Well it's €300 (€600 if you buy from Amazon) more expensive than the same-sized Galaxy S9 and €200 (€520 through Amazon) pricier than a larger Galaxy S9+. And a Google Pixel 2 XL is currently going for less than half the price of a brand new iPhone XS through Amazon, although we wouldn't recommend buying a Pixel 2 XL less than a month before the Pixel 3 rolls around. All this while we're focusing on the base 64GB iPhone XS and XS Max. Thing look even grimmer when you consider the storage price hikes. Well, on both the iPhone XS and XS Max moving from 64GB to 256GB costs €170 and from 256GB to 512GB is another €230. That's roughly the price of a Xiaomi Mi A2 Lite and Mi A2, respectively. Now imagine this - the new iPhones start at €1,150/£999 and they still don't offer a fast charger in the box. You pay at least the combined price of 1 Galaxy S9+ and a Galaxy S9 and you'd still need to pay some $68 for a charger and a cable capable of fast-charging your new iPhone. That's an atrocity right there. Prices may vary slightly in some markets but the point is the same. Apple's new iPhones are expensive and you can get an Android phone that's just as good in most aspects (and better in some) for much, much less. Sometimes you can even get two Android phones that are just as good for the price of just one iPhone and that's ludicrous. I'm not saying that the iPhone XS/XS Max are bad phones. I'm not saying don't buy one and we're not saying buy this or that instead. This is just me trying to give you a different perspective on things.